Cover Care’s Dean Mikels, Jared Pepmeier, Darren Cardwell, and Mitch Valdez present the company’s donation to Kate Hayward and Duchess Adjei of the American Red Cross. 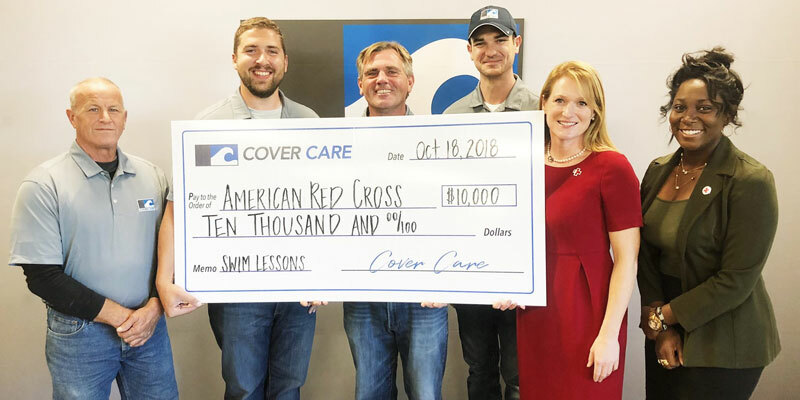 Cover Care has made a USD$10,000 to the Aquatics Centennial Swim Lesson and Water Safety Program that provides access to swim lessons to families throughout the United States. The national service company which specializes in the installation and repair of automatic pool covers presented the cheque to the American Red Cross in October at the American Red Cross headquarters in Indiana. The Aquatics Centennial program by the American Red Cross is a multi-year campaign designed to provide access to swimming lessons and water safety education specifically to communities where the drowning rate is high. The American Red Cross added drowning prevention to its mission 100 years ago and has been saving lives ever since with its programs.